sewing small talk: do you plan your sewing projects in advance? Do you plan your sewing projects for the year in advance? Or do you wait to see what will inspire you through the year? Many sewists have been participating in #makenine2019. Do you like to know what you’ll be sewing at the beginning of the year, or are you more spontaneous, leaving room for inspiration (and maybe new, upcoming pattern, hint hint) as the year progresses? 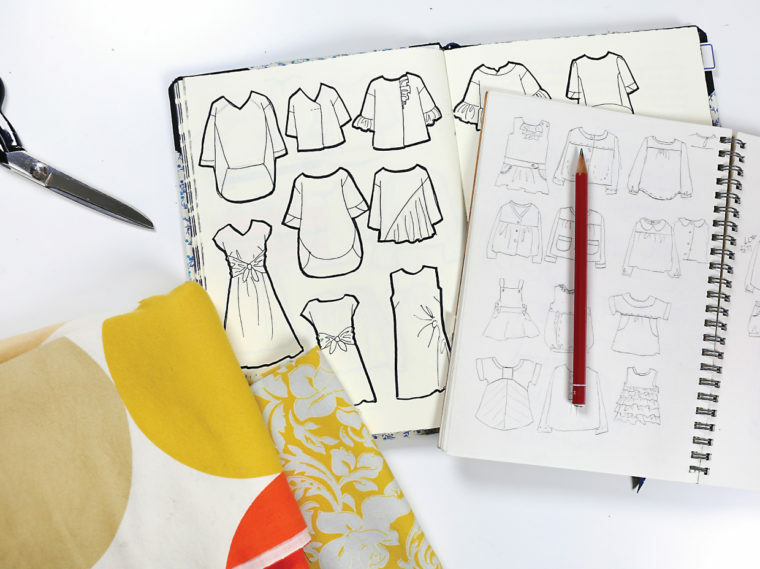 Tell us about how you decide what to sew and how far in advance you plan your sewing projects. Are you a planner or are you spontaneous? Or somewhere in between? Over the past two years I’ve tried to plan in advance. It was helpful to avoid the frantic “what do I sew now?” that I would often esperience after completing a project. I’ve sort of fallen away from it recently but want to get back to it (as I am currently in a “what do I sew now?” panic!). A couple times per year I will sit down and start a list/plan, based on either gaps in my or my kids’ wardrobes or to chip away at my stash. Identifying the next 5-6 projects–making sure I have the fabric, patterns, and notions–feels inspiring, but then after 2 or 3 into my list, I get distracted by a new pattern or fabric, and a new project jumps to the top of the queue! I don’t think I’ve ever finished a list. Finishing each project is enough satisfaction. I actually like the feeling of knowing that I’ll never be done. All my lists have been on scraps of paper that float around for months until I write a new list. This image makes me think that I should keep a notebook of my ideas! Somewhere in between. I keep a running list of projects I want to do, but sometimes I just need to sew something right away because I can’t get the idea out of my head. I like to sew spontaneously as inspired along with some seasonal planning about 6 months in advance. This year I have new skills to master, a second machine, new studio areas and a longing to move forward. The past few years have been full of life changes with little time so I am downsizing the stash and supplies to adapt. I don’t do a Make 9 or plan out a whole year, but I do like to plan 3-5 projects at a time. That way I can buy fabric at once and save on shipping and have things planned out for 2-3 months in advance. I like making multiples of patterns back to back so I can really refine the fit and perfect the pattern. Which is to say, I’m the ideal customer for all new patterns, lol. I don’t plan, if I see something I like or something someone else has made then I’ll get a pattern and make it. If I made everything I see (and there are some really nice items out there) or planned in advance, I’d never sleep. I plan my sewing projects but most of the time I end up making different things. Right now I have planned to make a mini capsule for a four day holiday at the end of April. I have bought fabric for three specific patterns so I hope this helps to stick to the plan. Which adult patterns are shown in the picture? I recognize some but not all of them. They are so beautifull. I plan ahead somewhat, but as someone said on FB things jump the line. Some examples: a drawstring bag for tent poles, a Fawkes the Phoenix Halloween costume, shortening straps on the bib of snowpants, various repairs, etc. I am entering into a new phase of sewing as I’m no longer in the fluctuating stage of pregnancy/nursing and I finally have time learn to sew & fit for myself. I try to plan & sew 2-3 things each season that fill wardrobe gaps or replace worn favorite items. I’m trying to go methodically, choosing simple items where I can learn about fitting adjustments and practice neglected sewing skills that can be applied over time to more complex items. Sewing for my kids serves as my quick/fun/sponantenous projects when needed. I have been keeping a list this year, but it’s really more of a list of things I would like to see up that week! And I have been known to sew up something on impulse, then put it on my list just so I can check it off!! I have projects that are months in the planning, and some that come together in a matter of hours. Usually it is because of a need (like Halloween or the Christmas concert with very specific restrictions) but sometimes an idea germinates and won’t let go but it could take months before pattern/draft, fabric and time intersect. I need to be better at planning and executing in a timely manner, especially because I have to work on reducing my fabric stash, and dd is growing like a weed lately — i need to check sizes every time! I only get to sew on weekends at naptime and then after bedtime, so I’ve tried to have ideas rather than plans. I keep a running list in front of my work notebook. It’s the first page, so that it doesn’t get lost, and I use it to daydream while I am in unproductive meetings. It’s more a list of priorities…in the fall it might include flannel pajamas for the winter or wool tee shirts and in the spring it might be shorts and light tops. I try to prioritize and shift things around as needed and time permits. At home for the top 2-3 things on my list, I’ll match patterns and fabrics and keep them in a bin closer to the cutting table so that I am focused on the things I want/need without getting distracted by all the options. I like to plan, but very often don’t get around to sewing the planned items in the short term. Last year I tried a rota system for the family, which only partly worked. The paired patterns and fabrics wait patiently while emergency birthday presents, guests and loss of sewing mojo jump the queue. I plan time to sew and I have a mental wish list. Last year I took part in Seamwork Design Your Wardrobe and that was the nearest I got to planning my sewing. As a result I knitted a cardigan and sewed three tops. I didn’t make the Everyday skirt or the Cinema dress I had also planned but I have added those to my wish list for this year. I also sorted my wardrobe and got a good sense of the gaps in my wardrobe. That helps with planning too. For the children I tend to plan by seasons so I aim to make school sunny day shorts in September and pyjama bottoms by December. The best laid plans… I also did the wardrobe plan from seamwork. My top project took 3 months to finish. So that puts me way behind in the queue. I’m afraid to go upstairs to my sewing room…messiness awaits. I’m making a new curtain for the window up there. As soon as the embroidery is done, I’ll do a re-org. And finish rather than start a. New project.